Douglas (Isle of Man) to Belfast. Ferries from Belfast, the capital of Northern Ireland, sail to the Isle of Man, Liverpool and to Cairnryan in Scotland and are operated by Stena Line and the Isle of Man Steam Packet Company. All of these ferries are available through AFerry. We also always have the latest offers for ferries to Belfast and you don't have to enter an special code. Belfast is a beautiful city surrounded by high hills and the sea. 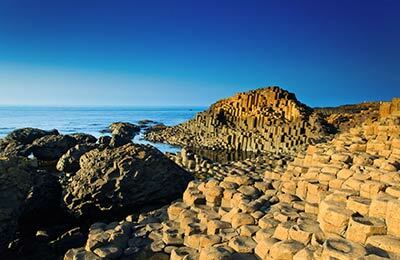 Belfast is a city full of magnificent Victorian buildings, lush green parks and charming pubs. 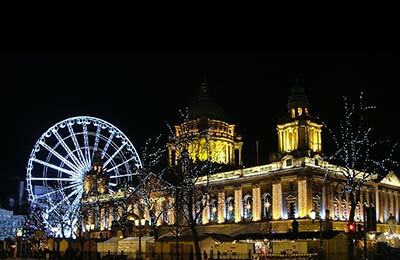 From Belfast Ferry port, you can easily reach the city centre and the numerous shops and shopping centers. On Saturday mornings you will find a Farm & Specialty Food Market, and on Friday, a 23 seafood stalls Market. In the south of the city there are many chic designer boutiques and plenty of cafes. Belfast has various attractions for children, like the Odyssey Complex and Belfast Zoo, as well as many interesting museums, theatres and festivals for adults too. Alternatively you could simply walk through Belfast's Victorian streets and discover the history of this fascinating city. When you travel with Isle of Man Steam Packet, you will find the Ocean Avenue shop selling a wide variety of products including newspapers and magazines. If you fancy something a bit to eat or a quick drink you will also find a choice of bars and restaurants on board. Steam Packet chefs and staff use Fairtrade and local produce from the Isle of Man meaning your food is not only delicious but kind on the environment too. Book your ferry to your favourite destination from Northern Ireland's capital city simply and securely with AFerry. Belfast Ferry Port offers a full range of services from lounges, toilets and bars to car parking facilities. Stena Line has recently opened its brand new Belfast Port complex. Facilities include a new terminal building, departure lounge with easier embarking access for foot passengers, a coffee bar, covered check-in area for car passengers, express boarding lane, ATM and a large car park. At the Isle of Man Steam Packet Terminal there are short term parking facilities, for set down and pick up. Long term parking is available in a Pay and Display car park. In the departure lounge of the Terminal light refreshments are available. The Stena Line Belfast terminal is conveniently located close to the motorway network off Junction 1 of the M2 Motorway (Fortwilliam roundabout). The port is clearly signed 'Stena Line' on motorways and roads in the vicinity to help you find the terminal. The Steam Packet Terminal can be reached via the M1. At the Broadway Roundabout take the 3rd exit onto the A12/Westlink, heading to the M2/M3, and continue to follow the A12 for 2.1 miles, then take the A2 and follow it for 0.7 miles, and you will see signs for the Port and the Steam Packet Terminal. To compensate for the luck of public transport to the new Stena Line Terminal, black public hire taxis operate a taxi-share scheme from the terminal to the city centre. Public transport, to and from the Steam Packet Terminal, are operated by Ulsterbus and Translink. These run a service between the Ferry Port, the Railway Station and the rest of Northern Ireland.